DO-20250-04 was succesfully added to your cart. Precalibrated to NIST-traceable standards. Reliable measurements, guaranteed! Infrared (IR) thermometers have become the preferred tool for diagnostics and inspection where temperature is the variable. Digi-Sense IR thermometers are valued by professionals in a variety of industries - from industrial maintenance to foodservice - because they quickly, accurately, and safely measure surface temperature. Plus, the NIST-traceable precalibration means you get reliable measurements right out of the box, saving you time and money! Since IR meters do not contact the objects being measured, they are the safest way to measure hot, hard-to-reach, or moving parts - eliminating potential damage and contamination. 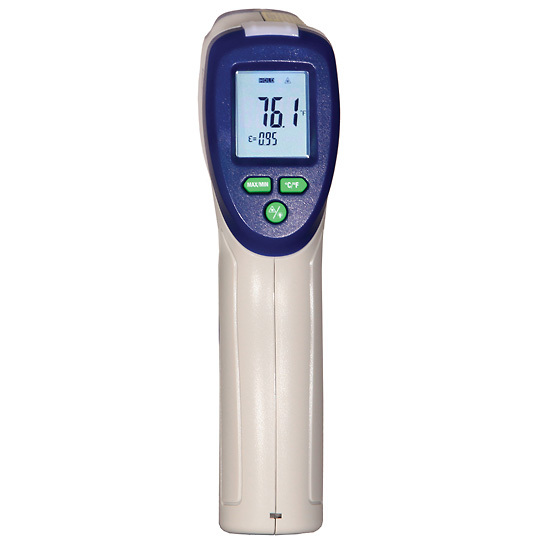 IR thermometers are easy to use: simply pull the trigger and the temperature will show in an instant on a large, backlit display. All models feature Min/Max and Hold functions, °F/°C selectable units, single targeting laser, large backlight LCD, and auto power-off. Model 20250-04 has all the standard features plus fixed emissivity at 0.95, a temperature range of –4 to 630°F (–20 to 332°C), and a distance-to-sight ratio of 10:1. One 9 V battery and NIST-traceable calibration report with data supplied by InnoCal.